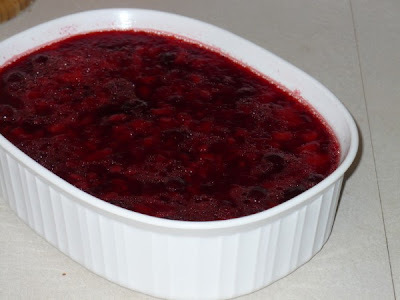 This is very simple, but my favorite Jell-o salad for Thanksgiving. I got it from my mom-in-law, Cindy. I actually prefer making it with raspberry. Dissolve Jell-o in 1 1/2 cups of boiling water. Add 1 1/2 cups of cold water, pineapple, and cranberry sauce. Mix well and refrigerate until set.